Hey everyone! Kiara and Jiyan both turned a month old. Kiara is now 17 months old and Jiyan is 3 months old. I am breastfeeding Jiyan currently and I got to try these UpSpring Milkflow Lactation Cookies before they were available to the public as a UpSpring's product tester program. 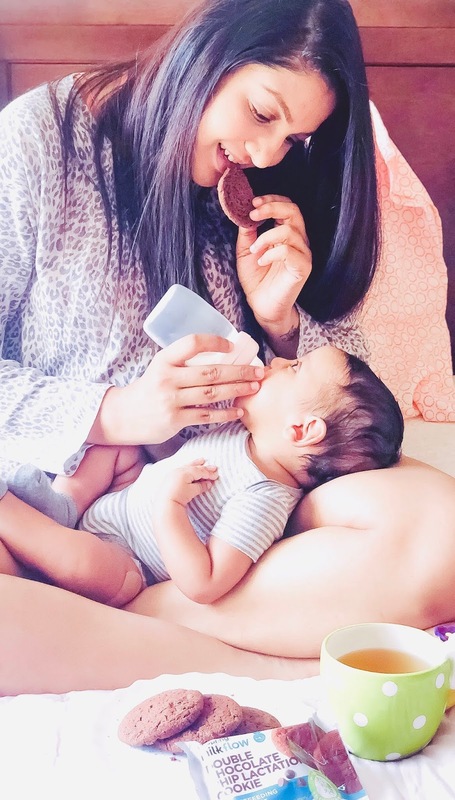 They are the only ones with the Fenugreek and does work better than the other lactation cookies that I have tried when I was breastfeeding Kiara. Not only these cookies helped me with my milk supply within the first 3 days, they tasted really good too. Honestly I can't believe these cookies are for lactation because they tasted just like a normal chocolate chip cookie. These premade lactation cookies are individually packed in sets of two, making it great for on the go. These cookies do have herbs in them like blessed thistle and fenugreek. These herbs are well known to help increase the breastmilk supply. Do lactation cookies really increase the breastmilk supply? Is it better to buy them or make them? It's all these milk boosting ingredients that gives real power to the cookie to help increase the breast milk supply. I heard for many moms that they had Great Success with these kind of treats. The best way to find is to know which recipe works for you. Since every moms body is different, we may respond better to some specific ingredients than others. But honestly, getting enough calories and protein can help increase our breastmilk supply. I have some great lactation cookies recipes which you can make it at home, which I will share in the another post. For all those non bakers, I would totally recommend these UpSpring Milkflow Lactation Cookies. What is good for us is good for him too! These sound like some interesting cookies for Mums who are breastfeeding. I had no idea there was anything like it on the market. Oh wow, seeing as I am not a new mother or anything...I knew nothing about this haha. But it seems like an excellent product. Will keep this in mind. These cookies would be great for a baby shower gift. A treat for mom that helps her milk is a good thing. These are pretty cool, I have a friend who is expecting. These would be great to add to the gift basket I have been putting together. I did not know these existed until this year, when I read about these cookies from another mom! How interesting. They sound yummy and probably helpful for mommas! This is the second time I am hearing about this cookies. Must be really helpful for all mommies out there. This is seriously the best gift for a new mom! A perfect baby shower gift! I’ve never heard of this snack before thanks for sharing! These cookies look very healthy and easy way for new moms. My mum used to give me lots of lentil water and ground dry fruits mixed with milk. Hehe. Lovely post. My daughter is lactating. I just shared your link with her. This is seriously the best gift for a new mom! Lovely post. I am going to share this with my best friend. She is going to be mom soon. Those cookies must be awesome for new moms for a good flow of milk for the baby. Wish I'd shared this with my mom then. They seem like a pretty good idea! Some people might really rely on this. Oh wow you have products like these? I would appreciate it though if these lactation products are readily available in the supermarket.